The perfect combination of coffee and chocolate in a cake! Features organic flour, Homeland Creamery buttermilk, free-range eggs from Ward's Farm and pure vanilla. Mmm … 3 layers of sweet chocolate cake with chocolate frosting. This is the cake that launched our bakery! Made with organic flour, local free-range eggs and pure vanilla. You may wonder why we have two chocolate upon chocolate cakes on our menu ... we questioned it as well! But ... once you taste each of them you will see how totally different they are! 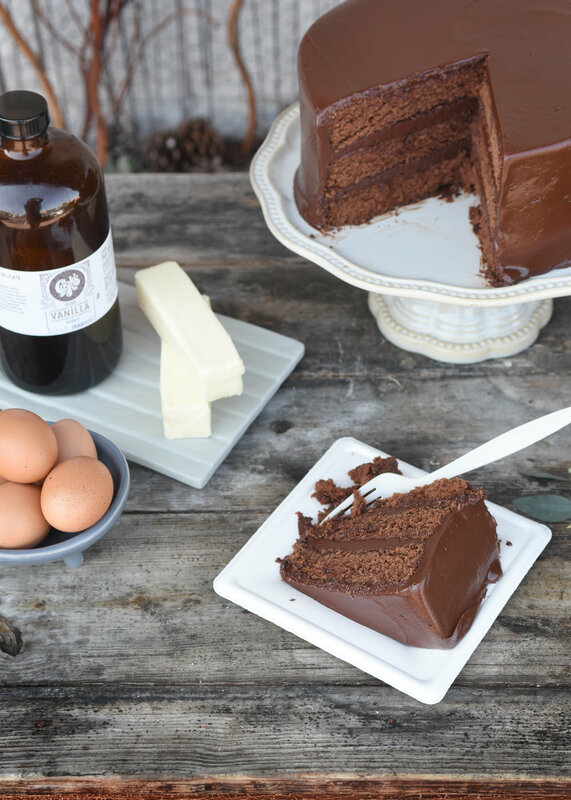 The All American Chocolate cake really makes us think of a cake mix cake ... for all the right reasons! ( But it's not ... we make it from scratch just like all of our other cakes!) It is fluffy, yet rich, has a tender crumb, and just begs for a glass of cold milk to drink along with it! Made with organic flour, local free-range eggs and pure vanilla. Featuring our house-made chocolate mousse that is so very delicious! Chocolate cake layers with chocolate mousse filling and then iced in either chocolate icing, raspberry cream cheese icing or strawberry cream cheese icing! We enjoy this cake in many forms! The perennial kid's favorite cake flavor! Butter cake with chocolate icing. Pure and simple. Silky chocolate almond icing enrobes this velvety chocolate cake. Made with organic flour and organic almond extract. Something for the kid in all of us! Chocolate cake enrobed in layers of chocolate cream cookie buttercream icing! We use organic flour, local free-range eggs, pure vanilla, and chocolate cream cookies made without palm oil. All American chocolate cake layers, filled with vanilla buttercream. Made with organic four, local free-range eggs and pure vanilla. Chocolate cake with cream cheese frosting…the icing seems to make the cake even more tender! Made with organic flour, local free-range eggs, and pure vanilla.